The Kitchen Debate were interpreter talks between U.S. Vice President Richard Nixon and President Nikita Khrushchev at the American National Exhibit on July 24, 1959 in the Soviet capital, Moscow The talks were called the "kitchen debate" because the USA had built a model home (and kitchen) in Moscow. 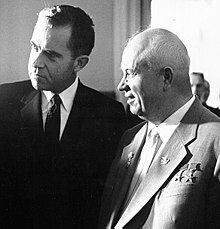 Nixon and Kushchev debated each others technology as both countries were still committed to the Cold War with each other. The Soviet Union had the better rockets as they had just launched the first satellite called Sputnik. However America had colour television and washing machines, although Krushchev said the Soviet Union had washing machines too. ↑ 1.0 1.1 Safire, William. "The Cold War's Hot Kitchen," The New York Times, Friday, July 24, 2009. This page was last changed on 18 July 2018, at 09:20.